Why Would I Want To Make My Own Ice Cream? Is It Cheaper To Make Ice Cream At Home? Is Home Made Ice Cream Healthier? If you love ice cream, but are keen to know exactly what goes into your favorite treat, and perhaps even try out some flavor ideas you've not seen on any stall, then an ice cream maker may just be for you – you'll need a freezer, obviously, and a little bit of patience, but, other than that, making your own ice cream at home is something anyone can do with the right piece of kit – and we've drawn up some handy reviews to help you find exactly what you're looking for. From Hamilton Beach, this ice cream maker is ideal for those with some experience of making ice cream, and offers the opportunity to just add your ingredients and walk away. It will stop (abruptly) once the ice cream is ready, which can be disconcerting to first time ice cream makers. It also really needs a full awareness of the quantities of each ingredient required, although it does come with a free recipe book included. If you don't have much practical experience, but a lot of willingness to get stuck in and have a go, this will work well for you. A couple of criticisms of the Hamilton are that it is noisy when in operation, and not really durable. It is perfectly fine if you're just looking for a summer of fun, experimenting with making your own ice cream in the comfort of your own home. 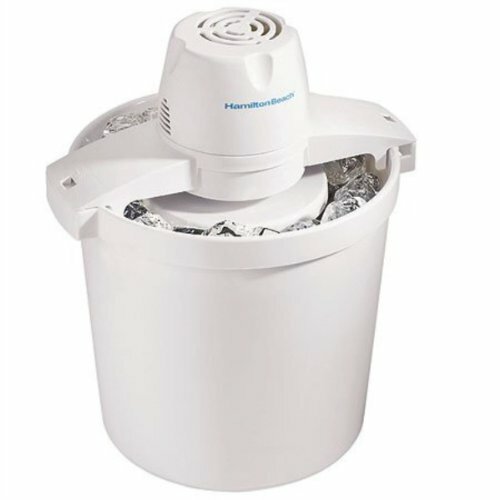 The Hamilton can be used to make ice cream, custard, gelato, sorbet, and frozen yogurt desserts. From Nostalgia's Vintage Collection, this quirky design includes an aluminum inner canister, for easy cleaning and durability, a see-thru lid, so you can watch the action as it happens, a carry handle, for getting your tasty creation to the table in its eye-catching container, and a full recipe and instruction manual, making this a good choice for the complete newcomer to ice cream making. It is electric, so no stirring is required, although it has been commented that the gears, which are plastic, would benefit from being metal. Overall, the Nostalgia seems a little cheaply and poorly made, more designed for a brief summer of fun than a lasting family pastime. As a stylish talking point, it's a winner. Cuisinart provides us with a stylish, easy-clean brushed chrome model, the ICE-70, which will look good in any kitchen. It features three speed settings, and an auto shut off safety feature, and, while it is inclined to be a little messy to use, partly because of a lid which has been observed to fit a little poorly, it is overall, a good ice cream maker. We think it's ideal for regular, prolonged use – the perfect addition to any family kitchen. 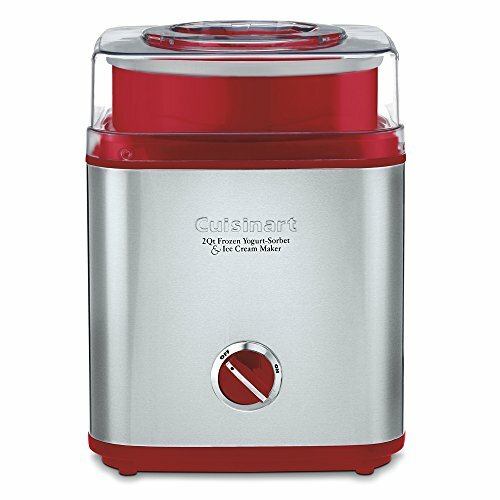 Also from Cuisinart is the Pure ICE-30R, which comes in a striking and stylish red brushed metal, featuring a large ingredient spout, so you can easily add in extras like nuts and fresh fruit whilst the machine is in operation, yet in a compact size. A couple of drawbacks are that this machine is very noisy when in use, and the ice cream can come out very soft, although the latter may be an issue that can be resolved by chilling the unit right down before adding any ingredients, and quickly transferring the ice cream to the freezer once the ice cream maker has done its work. Finally, Whynter is coming! This is the ICM-200LS, which offers powerful compressor cooling. 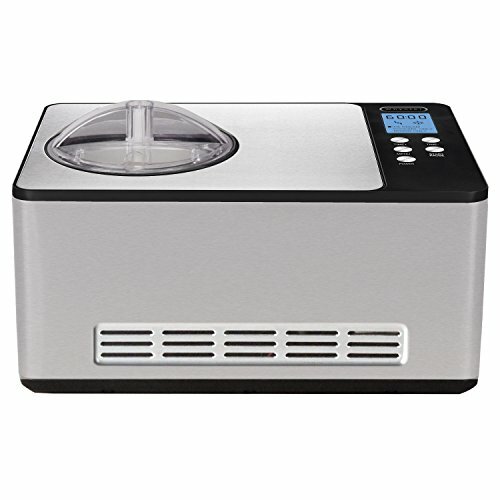 That means there is no need to pre-freeze the unit, something that is common with other models of home ice-cream maker. 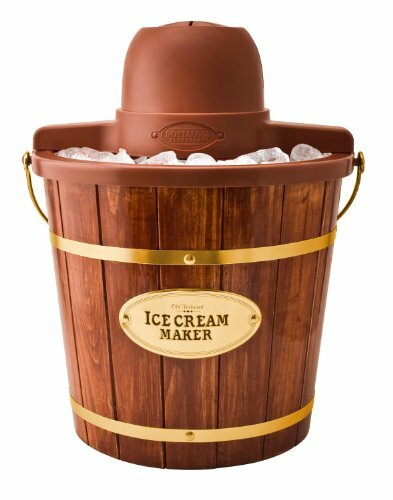 That flaw in other units has led to the observation that “it would be as easy to get a bucket and wooden spoon” - that's definitely not the case with this model, which is all about effortless ice cream. This ease is aided and abetted by an LCD timer and temperature display unit, and automatic shut-off should the ice cream mixture freeze solid – this feature prevents damage to the blades and gears, and increases the functional life time of the product. However, some comments have been made regarding the apparent low quality of the interior components, and the fact that, perhaps because of the compressor cooling, ice crystals form very easily in the ice cream, meaning the finished product isn't as smooth as some people might reasonably expect. Quite apart from becoming the favorite parent on the block, and a guaranteed dinner-party winner come dessert time, home made ice cream tastes far better than store-bought, and gives you the opportunity to accommodate preferences and allergies, by quickly and easily adding your own choice of flavorings, whether that's fresh fruit, chopped nuts, chocolate squares, chopped dried fruit, or syrups. Individuals who are lactose intolerant can still enjoy ice cream, as making your own gives you the freedom to use appropriate milk substitutes, ensuring that everyone can feel included in summer fun. In the long run, if your family eat a lot of ice cream, possibly, but, bear in mind that, quite apart from the initial outlay on the ice cream maker, quality ingredients are going to cost money, too. Making ice cream at home is more about quality, and ensuring a fun, tasty product that is as healthy as it can be, rather than saving money on the grocery shop. Also, it is worth remembering that, when you're making your own ice cream, you get to choose how it's served – why not try making an ice cream sandwich, using wafers for bread, rather than just serving it up into a cone or a bowl? Yes, because you can choose exactly what goes into your mix – although remember that making ice cream requires the use of quite a lot of salt, and that's not something that can easily be adjusted. But you can easily sweeten your ice cream with natural, fruit sugars, which are a healthier, and tastier, option, and you're easily able to use a lower-fat-content milk or cream.